Just saw a post about hunting on a kayak in the kayakfishingstuff.com "Cajun Country" forum. So I posted that we have a new product that can offer hunters some coverage. It is originally designed as a spray and wind Dodger. This will be available by January I think. They are in production. 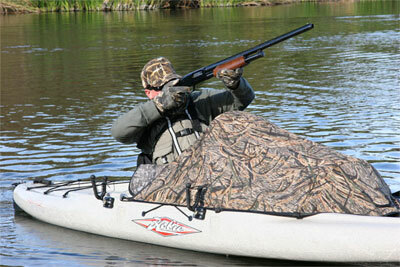 <<How about hunting on a Hobie Mirage? We have a new dodger available soon. Since the boat is pedaled, you can have the dodger in place at all times. We are working on license issues for the camo print, so that one will be a little longer. Ready to fit on the Outback, Adventure and Sport (grey and yellow available by January I think). Retail priced at about $100.00 The camo will likely be a little more due to the license fees for this camo print from Mossy Oak. The Dodger is simple to install and requires moments to attach when you want to use it. Folds down forward if you want to access the cockpit or make pedal adjustments. We are talking truely stealth mode here. People will not be able to figure out how you make your boat move! You can see by some of the pictures that the Dodger comes up high and wide before tapering back down for a tighter fit at the body. That stops most wind and spray. A good spray top can help the upper body. The face? We used to wear a face shield when sailing the Trifoiler due to the amount of spray. Not sure you would feel like wearing one, but Garth had a helmet with spray shield that was pretty cool. Kinda like wearing a full face shield on a motorcycle. Last edited by mmiller on Mon Nov 14, 2005 5:43 pm, edited 1 time in total. Here's a model that's sure to protect you from the cold spray in the face! Or, you could take up shore fishing. What about the gun mounts? I heard there's a guy in Oceanside, Ca. (about three blocks down the street from the Hobie factory) that'll mount one of these on the bow or tank well of your Outback or Adventure. Smaller caliber available for your Sport, of course. Post subject: The dodgers are her the dodgers are here! The dodgers are here the dodgers are here! Well almost. They should be ready to ship in about a week. We will have the yellow and the silver first with camo following in another month.